to 2 and the GMI-R is at 3. By my count, Friday was the 3rd day of the new short term down trend in the QQQQ. While all of my short term indicators look weak, my weekly indicator remains positive. For now, this implies to me a short term down-trend within a longer term up-trend. So, what to do? I am sold out of almost all stock positions and still have some puts sold on 3X bullish ETF’s. I may close them out with losses this week. This is not the time to be a lone brave person trading against the short term trend. It is always possible that this short term down trend could turn into a long term down trend. If that happens I will go to cash in my university pension and trade QID in my IRA. But that would require a much larger decline from these levels. Only time will tell. The key is to conserve capital so as to take positions once the short and long term trends are again in synch. Only 9% of the Nasdaq 100 stocks have their MACD above its signal line. This is a sign of extreme short term weakness. 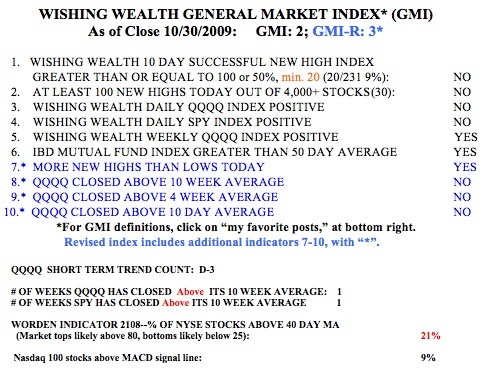 The QQQQ and SPY are both below their 10 week averages. When this occurs I rarely make money trading growth stocks on the long side. I still own some GLD and have small hedged positions in NFLX. This could be another decline that sets up a rally into options expiration in 3 weeks, but we don’t know for sure and I won’t bet on a year end rally. Time to have close stops and be very careful. Market up-trend back on track after bouncing off of Bollinger band; Gold shines, STEC falters. I have been following you for about 2 years now. I am trying to find some cues for a small investor, that are buy/sell triggers. I have been trying to correlate MACD and Bollinger to what you indicate are good trend points. I do agree with what you have stated about QID TYH QLD and such. I have tried stock picking over the years and it hasn’t worked nearly as well as DCA.